Prufrock's Dilemma: "Let's say we had wings . . ."
Let's say we had wings, and a different breathing system, enabling us to travel through space. These would in no way help us, for if we visited Mars or Venus with the same senses we now have, we would see everything as we see things on Earth. The only true voyage, the only way to immerse ourselves in a "Fountain of Youth," would be not just to visit strange lands, but to have other eyes, to see everything through the eyes of others, of a hundred others, so as to see the hundreds of universes each of them sees, that each of them is. This we can do through art, through a painter, like Elstir, through a composer, like Vinteuil. With creators like these, we really do fly from star to star. —Marcel Proust, from À la recherche du temps perdu, vol. 5: La prisonnière. The concert was part of Bard’s Summer Music Festival for 2012, Saint-Saëns and His World. Steve Smith, a festival veteran, wrote of the first weekend in the New York Times. I look forward to reading his report on Weekend 2.
is Distinguished Professor Emeritus of French. His biography Marcel Proust: A Life was selected as a “Notable Book of 2000” by The New York Times. Harold Bloom has written that Carter is “Proust’s definitive biographer” . . . Although I may post something of note that occurs during this period, Prufrock’s Dilemma generally remains on hiatus, and I will be mostly offline through Labor Day (U. S. version) weekend. Thereafter, a “new edition” of Prufrock’s Dilemma will begin. Credits: The image at the head of the post can be found here. The Proust quotation is as indicated, one of several chosen by Larry Bensky, who moderated the pre-concert panel, and who, among other things, is host and executive producer of Radio Proust. The quotations about Radio Proust and Proust Ink are at the indicated links for those sites. This music is certainly wonderful, but a live performance always elevates to an even higher level of satisfaction.We are sure that your concert will have been a most memorable occasion. The quotation with which you start this post is so very apt and does reflect in so many ways our own thinking. For us, Art in all its forms at its best can really reach into the soul but one does have to learn how to look and how to hear. Increasingly, we wonder if people in general are seeing and hearing less in spite of the fact that they are more widely travelled than ever before and seem, when not glued to a computer keyboard to be permanently plugged into a machine. This kind of keeping me on tenterhooks should not be allowed. I watched an episode of my favorite television program on DVD last night. It's 'Northern Exposure,' and it aired in the early- to mid- nineties. It remains, for me, a creative effort which ceaselessly broadens my world view. I have always thought of myself as an empathetic person, but recently, through my struggles to find representation for my work, have learned from my failure that I have a long way to go. As they say, though, knowing is half the battle. In any event, my dear Sue, leave it to you to post something whose very title is like the sun in my eyes. Only my eyes are slowly opening to tetrachromacy. Thanks for this introduction to Franck's music. I liked it from the first few notes. And I love the Proust quote. -Looking forward to the new edition! yes, you make me start on a program of music education - thank you! (Well, if you look at Burstingwithhappiness, it is only the first grade - an art song from Herman Löns). 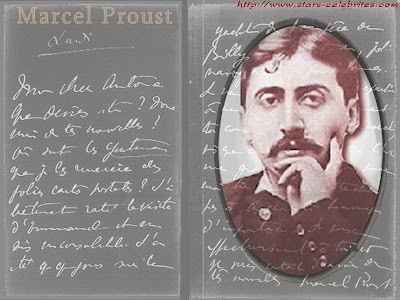 I do love Proust, read him back and forth - interesting that I see him here connected with music, while I just read Madame de Sévigné's letters - a witty woman of whom Robert Mindner said, that whole pages of Proust's work have their model in her. I'm looking forward to your new blog! How very true, how very relevant. I couldn't agree more. That's how I believe many differences in perceptions are resolved, after learning of the 'other' perception. Hi Susan .. one day I shall be able to easily connect and listen to your recommendations and then I can be on a wonderful educational journey from so many points of view ..
Oh my, what a gorgeous Prelude! I could actually read while listening to it--that doesn't happen often. Summer is the time for hiatus, isn't it? I wish we could live like the Europeans and take, well, almost the entire summer off. I'd not tire of it. It's rejuvenating effects benefit us all. What an interesting piece of music. I felt an ongoing theme of melancholy; combinations of anguish and desperation interspersed. Like the person is spiraling down, down, into an oblivious position before finally giving in to the source of universal control. The universe responds back with a moment of triumphant sound at the very ending of the piece. You bring back memories of college, when I slogged through Proust in French. Many of his sentences are so long that you have to take a deep breath, plunge in, and keep going, hoping all the while that you'll be able to hold the syntax and the meaning together long enough to make it to the period at the end. I never knew that the character of Vinteuil was based on César Franck, whose sonata for violin and piano is one of my favorite pieces. I'm curious to know whether the Bardic sages agree that 'the Vinteuil sonata' in Proust is the wonderful Franck Sonata for Violin and Piano, or whether it's more complicated than that? I started "Where the Heart Beats..." yesterday and am so happy with it. It is taking me back to things I've known before but forgotten. The most important of things. Thank you.